Are you a Nurse, Doctor, Pharmacist, Physiotherapists or any kind of health care professional; and you wish to practice abroad in countries like UAE, QATAR, SINGAPORE, IRELAND and many more? 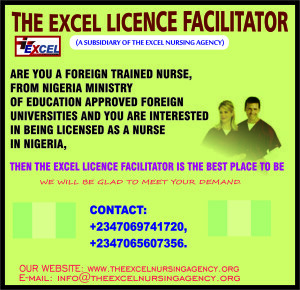 The Excel Health Care Professional Licensing Facilitator is aimed at helping health care professional practice abroad. Few Reasons Why You Need To Apply For License To Practice In United Arab Emirates? United Arab Emirates is among the developed countries in the world with zero crime rates, peaceful and accommodating to all Nationalities, culture and Religion. Dubai is the most populous city (about 2.1 million and projected to rise to 3.5 million in 2020) in the Emirate Kingdom and it is the second largest city after Abu Dhabi in terms of landmass. Although, the official language is Arabic, English language is widely spoken as about 83% of the citizens are foreigners with Indians alone constituting 53%. United Arab Emirates is a country with 7 states/emirates which are: Abu Dhabi (capital), Dubai, Sharjah, Ajman, Fujairah, Ras Al Khaimah and Umm Al Quwain. A rising demand for qualitative healthcare, increasing population, increasing in prevalence of lifestyle disease and the introduction of compulsory Health Insurance by companies is creating a demand for more Health Care Professionals. All health Professional is required to obtain their license prior to practicing in any health care facility in United Arab Emirates. The license must be current and valid at all time during the clinical practice of the Health care professional. Health professionals must ensure renewing their license 3 months prior to the expiry date. A Health professional license is associated with the health care facility they are working for. Please note: we are not an agent or working for any of the health authorities of the countries you wish to procure their license. We are here to share information and guide you through the processing (as deemed fit and on request by prospective client) to help achieve your goal of practicing abroad. All registration and licensing are done by the health authorities of the respective companies. Each country has their own licensing steps, feel free to contact us for the steps. For any individual who cannot in any form complete their registration on the Health Authorities website for different countries of your choice, and request our assistance to do so, we can help such individual, but all the official charges and other cost of running the processes for you must be paid by you. All applications are done on the Authorities official website of each country. We have just shared basic information about Licensing in UAE. We will share other information about other countries on request (and if deemed fit by Us). Please contact us for enquiry and details.